"The Raft People" is the 41st Mandrake Sunday story. The story was written by Lee Falk and drawn by Phil Davis. As the Argos moves lazily through a warm tropical sea, Narda sunbathes on a raft, pulled aft of the yacht. But the raft rope works loose from the raft railing and unnoticed by anyone, Narda and the raft are gone. 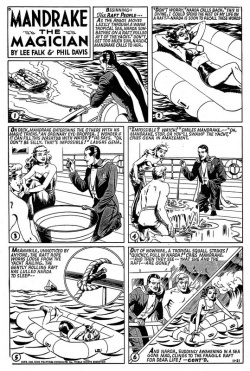 The title for this story is taken from the strip of November 21, 1948 (Beginning: The Raft People...).